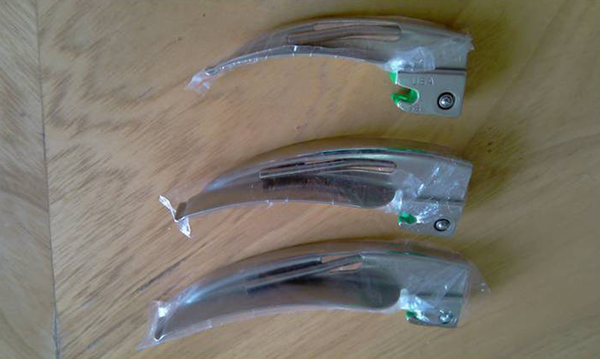 To Cite: Mahmoodpoor A, Soleimanpour H. A Simple Strategy for the Sterile Use of Reusable Laryngoscope Blades in Resource Limited Countries, Ann Anesth Crit Care . 2016 ; 1(1):e10234. doi: 10.5812/aacc.10234. The laryngoscope blade has a potential role for cross infection due to its contamination with bacteria, blood, and microorganisms. Cleaning the laryngoscope blade has various methods in different countries. Most operating rooms have no guidelines for laryngoscope disinfection after each usage (1). Some use tap water for cleaning which is an inadequate method while others add disinfectant to tap water which is more effective for the control of infection, but this may result in the emergence of resistant bacteria. There are so many disinfectants like aldehyde-free biguanide and Chlorine dioxide or chlorhexidine without any international guideline for common practice. Cleaning with most of these disinfectants is time consuming and needs at least 10 minutes for disinfection (2). In some centers, anesthesiologists use disposable blade laryngoscopes which brings, sometimes, difficulty in airway management especially in the emergency situations compared to standard laryngoscopes, because of the shape of the blade or light carrying capacity. Most of the single-use laryngoscopes tested were significantly inferior to the standard Macintosh blade. This raises concern over their use in clinical practice, particularly if intubation is difficult (3). The cost of disposable blades for laryngoscopes is almost 5 to 10 dollars. We have used a simple method for decreasing infection which is more cost-effective. In this method, we cover the blade with a transparent sterile sheet designed for each size of the standard blades. The cover does not reflect the light and does not interfere with laryngoscopy and the healthcare worker can throw the cover out easily after laryngoscopy and cover the blade with a new one without any cross contamination (Figure 1). When we compared the illumination generated by a disposable laryngoscope blade with the same power source, we found that the illumination was not reduced with the cover compared to the standard practice. The cost of the cover is almost 50 cents per se. We used this method for more than 250 patients undergoing ophthalmic surgery without any complication. After laryngoscopy if the sheet was intact we simply withdrew it, but if it was not intact or we were suspicious about it, we considered cleaning it with tap water and disinfectant. Chen et al. in their study showed that using latex condom as a laryngoscope blade cover during laryngoscopy is a simple inexpensive and effective method for decreasing cross infection among patients (4). Based on our experience, we recommend this very simple and cost-effective method as an alternative method for decreasing cross contamination of laryngoscope blade especially in resource limited countries where there is not any national guideline for blade disinfection. As it is seen, there is an important gap to be filled and urgent investigations are needed in order to optimize the standardization of the efficient and optimal interventions to clean and disinfect laryngoscope blades to decrease the potential risk of cross contamination.